Dylan Mint, a Tourette’s sufferer, believes that he has only six months to live. At sixteen, he has so much he wants to do, but he pares it down to three ‘Cool Things To Do Before I Cack it’. His twitches, tics, and swearing indicate a ‘mega-eruption’ in his head. His growl is his refuge when Mr Dog bites. He has his green stone to rub, and his counting to help him focus. Dylan is not a victim. He is well-adjusted, happy, highly intelligent, logical and compassionate. He is also protector to his best friend Amir against frequent humiliation and abuse due to his origins. This outstanding book is full of humour mixed with pathos. It reflects the reality of life with Tourette’s Syndrome. It is full of courage, love and the struggle of a mother to maintain a normal life for her son against incredible odds. Dylan is one of the best creations I have come across. I was moved to tears, entertained, shocked and overjoyed, and learnt so much about life as I read this unforgettable novel. The clever writing is interspersed with 60s rhyming slang which is part of the main character’s speech pattern. This linked with a fantastic storyline, powerful characters, and riveting content, serves up a fascinating and highly entertaining read. 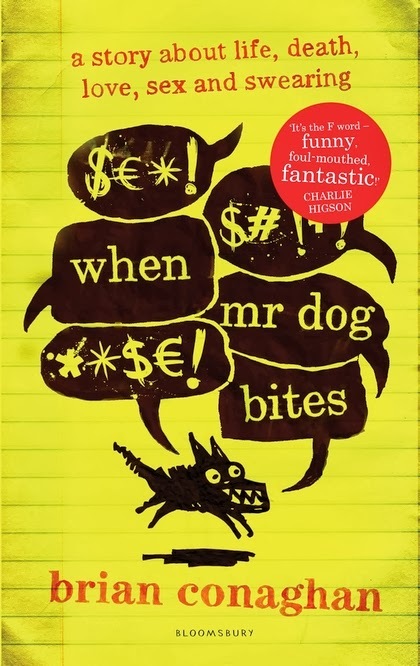 When Mr Dog Bites is Brian Conaghan’s second book and is for a crossover YA/Adult readership. It comes with a ‘Parental Advisory’ warning about explicit and strong language. It’s certainly not suitable for younger readers although it has been mentioned on the internet as being for the 11+ age group.